The EF508KC NEX is handcrafted in Takamine's pro series facility that has been building precision quality instruments over five decades. Beneath the impressive figured Koa is a world-class acoustic/electric guitar that will handle any application whether in a full band setting or solo performance. Features include a fully bound body and fretboard, finished in natural gloss accentuating the exquisite grain structure of the Koa. The mahogany neck is joined to the body with a traditional, ultra strong dovetail joint. Dual action adjustable tension rod keeps the guitar playing true no matter what the environment. 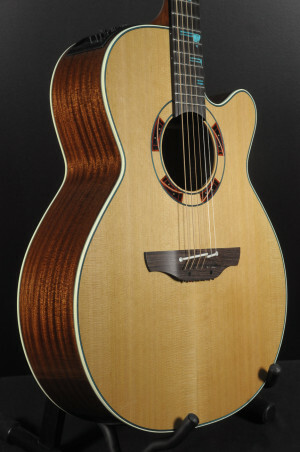 The Goodall Grand Concert might be one of the world's most perfect guitars. With its refined and beautifully proportioned shape, it is everything you could desire from an acoustic guitar and more. It's tone is a wonderful blend of balanced clarity, and punchy projection, with a smooth rich bass response. This instrument is larger than the Parlor but smaller than the Concert Jumbo. It has a singing lyrical treble, with excellent sustain, and is comfortable to hold. Though it is a small guitar, the Grand Concert does not exhibit the tight nasal tonal quality in the midrange and bass that is generally associated with smaller guitars. While the Grand Concert series is considered ideal for the fingerstylist due to its sensitive, dynamic responsiveness, it is equally appropriate for the flatpicker or plectrum player with the appropriate tonewood combination. It is prized by Bluegrass flatpickers and has even been said to surpass large bodied dreadnought guitars with respect to it's clarity, sustain and powerful projection. 1942, what a year! The nation was struggling to get on a war economy. Virtually no manufacturers were doing business as usual. Everything was geared toward the war effort. Gibson guitars was no exception: they made gliders, while guitar production was severely limited. Dealers were allowed very few guitars. Some months, no guitars were shipped. We have a beautiful 1942 Gibson L-30. These small archtop guitars were a staple item for Gibson since the early thirties. This is an original, clean guitar and even has the original soft case. The finish is beautiful, the frets are fine, the action is good. It is a collectors grade instrument. Some wear, but overall excellent condition. These are great guitars for blues, but really they are great for any type of music. This is a one-owner instrument and has been well taken care of. 1918, wow, that was a long time ago. The end of WWI, the United States Congress officially established time zones, God Bless America was written by Irving Berlin, and this mandolin was made. This mandolin has seen a lot of history. When we entered WWII, this mandolin was already 23 years old. We have a 1918 Gibson Style A Mandolin. We believe it was sent back to Gibson at some point and refinished. It has a new bridge to compensate for a slight sinking in the top. It is structurally fine, it won't cause any problems, and the original bridge is included with the mandolin. The top is black, the back and sides are brown. It shows some lacquer checking as to be expected. Overall, it is very clean. It sounds great, the action is fine, the frets are in good condition. It's a good one. Comes with non original case. Hofner made some cool guitars back in the day. They still do, but I like the vibe of the old ones. This guitar is quite similar to one Brian Jones used in the studio with the Stones. We have a 1968 Hofner 489 Western Model. It is a slope shoulder dreadnought. Looks like a Gibson J-50. It has maple back and sides, a spruce top, adjustable bridge saddle, and micro tilt to adjust the neck angle. It is clean, very clean. It has some lacquer checking, but the only real playing wear is on the top near the lower part on the soundhole. The neck is straight, the frets are fine, the action is good, and it sounds great. It's really a cool guitar. The maple is nice and flamey. It's a cool part of 60's history. Comes with original gig bag.